All sprinkler systems require two major components. One is a viable water supply, and the other is an electrical source to power the timer mechanism and the remote valves. Since there wouldn't ordinarily be enough water to cover the entire lawn area at once, the lawn is sectioned off into "zones". Each zone is coupled to a remote electric valve, which in turn is connected to the timer. The timer is programmable, allowing you to set each separate zone to run for a predetermined length of time. The water supply is tapped, generally in the house, and piped outside to a valve box containing any number of valves. These valves are connected together by a manifold system. From each valve a pipe is pulled that connects a series of sprinkler heads on that zone. The number of heads that can be run on one zone is determined by the amount of water that is available. The timer is connected to the series of valves by a multi strand wire. By connecting the timer to the valves you have the ability to electronically control the remote valves by writing programs into the timer, or to manually run individual zones anytime. The outside water piping is pulled underground by a purpose built machine. Blue Sky Irrigation uses a Ditch Witch 255SX model. 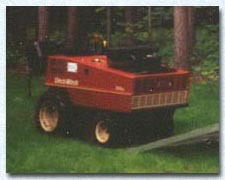 It is an all hydraulic, all wheel drive tractor type, with a pulling blade on the rear. The blade has an attachment that the piping hooks to, and when lowered, slices the sod, and lays the pipe at the same time. Each system contains what is called a "backflow device". The purpose of this is to prevent water from the sprinkler system from getting into the potable water supply. Different locales call for different types of backflow devices, but in every case, there should be one installed on your system. Special consideration should be given to systems operated from water wells. On a city water system, there is a constant pressure and flow. Since these numbers are given, a system on city water is relatively simple to set up. Water wells, however, can deliver greatly different flows and pressure as the water is used. For an in depth look at water wells and irrigation systems, go to "Water Wells & Irrigation".